Thanksgiving is about gathering with family and friends.Its a time to be thankful for everything in our lives. When it comes to traveling to reach those families and friends, historically, Thanksgiving is one of the busiest times to travel. This year AAA predicts 46.3 Americans will travel for Thanksgiving. Thanks to the lowest Thanksgiving gas prices since 2010, this year a lot more people will not only be traveling by air, but by car too. According to AAA the Wednesday before Thanksgiving is the busiest travel day of all and most people will travel at least 50 miles or more from their homes to be with friends and family. Those of you traveling on the east coast need to be prepared for winter storms. According to the News, snow storms are already present all along the east coast. New York area, is blanketed by snow 6 to 10 inches. A messy storm brought drenching rain and heavy, wet snow to the East on Wednesday, awful timing for one of the busiest travel days of the year. 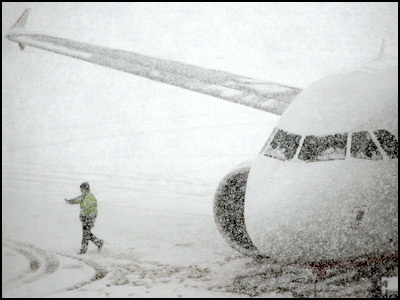 As of late afternoon Wednesday, nearly 670 flights had been canceled, according to FlightAware. Roads were slick and wet from rain or snow all the way from Florida to Maine. Travel is going to be difficult, but in some areas that have the heaviest snow, it may become next to impossible for a time. There was snow at the three New York City airports and in Philadelphia as of early afternoon, WeatherBug reported. There were three-hour delays at Newark Airport, a two-hour delay at LaGuardia and 90-minute waits in Philadelphia and at JFK Airport. Numerous auto accidents were reported across the Northeast, where by midafternoon the line between rain and snow ran roughly along I-95, the chief route between Washington and Boston. Of course it’s always best to get to the airport early, but you can also take advantage of the many airport and airline apps that are available for your smart phone. You can see maps of the airport parking areas, keep tabs on flight delays and most airlines allow you to check-in using a mobile app. This can save you from standing in long lines. Try to pack light and avoid checking a bag. Checking a bag will cause more delays and if your flight is cancelled or delayed, you may be without your bag for a while. For those who are braving the roads, plan out a smart route with GPS, that avoids busy routes. The I-95 corridor on the east coast could see delays from the winter storm. Try avoiding driving on the busiest days, like Wednesday and Sunday. Make sure that if you’re driving in snow, you know how to handle snowy and icy conditions. Drive slowly on ice and snow – particularly on bridges and overpasses, as these tend to freeze first. Use your low-beam lights in snow. Take water, snacks and warm clothes with you, in case you get stuck. If you skid – don’t panic, don’t slam on the brakes, release the gas pedal slowly and steer the car in the direction the rear is sliding (rear sliding left, turn the steering wheel to the left). To be safe, just take it slow and don’t take risks – if the roads are too unsafe stop, pull over and put your hazard lights on. This entry was posted on November 28, 2014 at 2:28 am and is filed under Uncategorized. You can subscribe via RSS 2.0 feed to this post's comments. You can comment below, or link to this permanent URL from your own site.